A fascinating thing happens every time Trump does a thing a segment of his base disagrees with. At first, there's a little wellspring of outrage. For maybe an hour. A few people here and there saying that this will be the thing that causes them to stop supporting him. Then, sure enough, within another hour you see other people either saying they now see Trump's bad thing was the right thing to do all along or that the bad thing is actually a brilliant 4D chess move. And by the next day, everyone is on board. This is what happened with Net Neutrality. For months before Trump pushed to get rid of Net Neutrality, it was one of the few things that many people on the various forums would say would cause them to break with him. But, when push came to shove, they all jumped right in line and decided that they had ALWAYS been at war with Net Neutrality. Yesterday, when Julian Assange was arrested, there was a swift outcry from his supporters on the Right. They were mad that he had been arrested, they were mad that Fox News was acting like he was a bad guy, that the Daily Caller was making fun of him, etc., etc. It created a divergence between a large faction of the Trump base and GOP leadership, which was quick to condemn Assange. Perhaps ironically (though entirely predictably), the only politicians speaking out at all against the arrest and the charges against him were Democrats Alexandria Ocasio-Cortez (through a retweet), former Alaska Senator Mike Gravel, and Tulsi Gabbard. 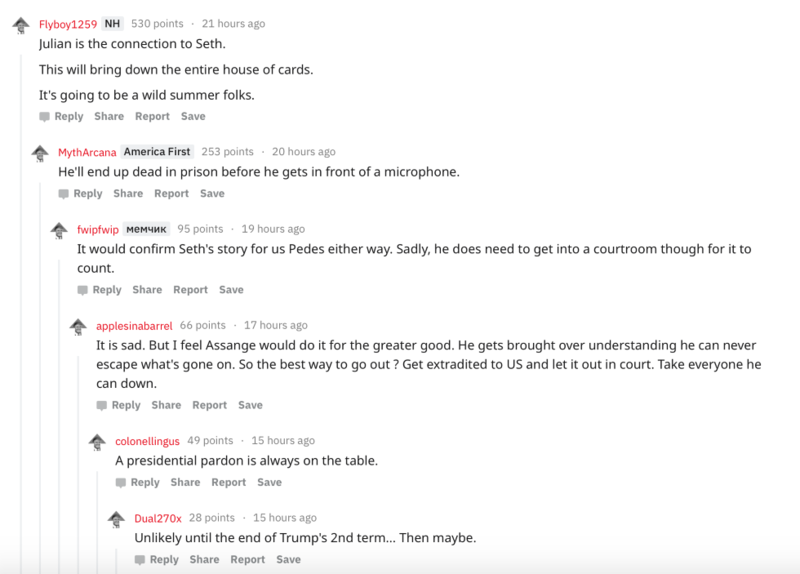 I even noted in the Wonkette Chat Cave that prosecuting Assange could be a serious breaking point for a lot of his supporters. Ten minutes later, I retracted that statement. Because soon enough, someone, somewhere, landed on a theory as to why Trump would be so cruel as to prosecute someone who worked so tirelessly to help him win the 2016 election. It is a stupid theory, but it is the one that many have decided to stick to, nonetheless. 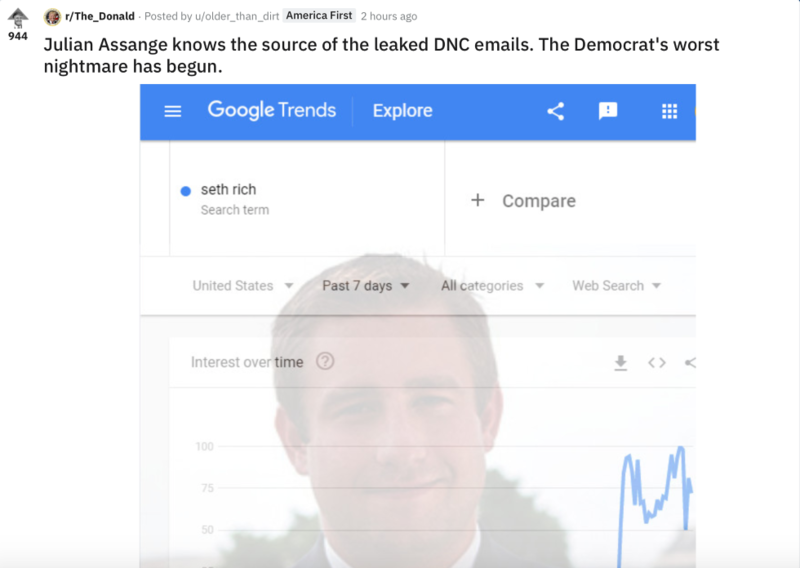 The gist of it is that Trump's DOJ is going to prosecute Assange, but only so that he can prove once and for all that Seth Rich is the one who leaked the hacked DNC documents to Assange (he was not) and that his murder was not a regular murder, but rather a murder orchestrated by Hillary Clinton herself. They've even got some real solid proof right here. Who could contest it? Clearly, people are Googling. It must mean something. Alas, this all seems a tad unlikely given that Trump has now gone all "I don't know her" on Wikileaks since the arrest. While not all Trump supporters are into the whole QAnon thing, this kind of mindset is breathtakingly common throughout the general Trumposphere. Many an ardent supporter has been banned from r/The_Donald for questioning the wisdom behind anything their "God Emperor" does. It is simply not allowed. While there are certainly exceptions to this rule, there is a strong subset of supporters willing to twist themselves into knots in order to find a way to rationalize anything he does, says or believes. There must always be a reason, a higher purpose, a thing he is doing that they are not smart enough to understand because he is a genius and they are not. You know, for as much as people complain about the Left being "fragmented," that we "eat our own," as many ridiculous "Dems in disarray!" articles get published -- I would take that any day over this kind of crap. I could not possibly be more thrilled to be in "disarray" if it means I am free to say "Hey, I usually like what this person does, but in this instance I disagree with them" instead of having to concoct some elaborate and utterly bizarre fantasy for why it is good that they are doing the thing I would otherwise think is bad. That is exhausting and also stupid.